San Francisco State University President Leslie E. Wong announced on Oct. 1 that he will retire at the end of the 2018-19 academic year, effective July 30, 2019. President Wong is the University’s 13th President and was appointed to the position in 2012. His career in higher education and administration spans 46 years. “During my time at San Francisco State University, we have remained united in our passion for academic excellence, intellectual discovery, creative and critical inquiry and educational equity. It has been an honor to serve with such a talented and committed community of students, faculty, staff, alumni and donors who have achieved so much and have helped shape the University in immeasurable and positive ways,” Dr. Wong said. During his time at San Francisco State, Dr. Wong has been dedicated to moving the University forward to achieve its full potential. Upon his arrival at SF State, he co-chaired the now-completed strategic planning process that has provided a value-driven roadmap to advance the University’s goals. In addition, he greatly expanded the University’s alumni relations programs both nationally and internationally, reaching out to alumni throughout Europe and Asia. Dr. Wong also launched SF State’s first comprehensive fundraising campaign, “Bold Thinking,” to provide the resources necessary to support the needs of SF State students in the 21st century as well as the innovative research and creative projects of SF State students and faculty. Early campaign successes have contributed to new scholarship funds, the renovation of the SF State gym, the construction and completion of the Mashouf Wellness Center, the revitalization of the athletics program and the groundbreaking/construction of the new Liberal & Creative Arts building, the first new academic building on campus in 25 years. He has been instrumental in the progress of the Holloway Mixed-Use Project, which is now underway and will make room for significantly more student housing along with street-level businesses. This project represents the University’s first public-private partnership, setting the stage for future additional capital projects. Under Dr. Wong’s leadership, the University was designated a Hispanic Serving Institution and is also recognized as an Asian American Native American Pacific Islander Serving Institution. Dr. Wong holds a bachelor's degree in psychology from Gonzaga University, a master's degree in experimental psychology from Eastern Washington University and a Ph.D. in educational psychology from Washington State University. Prior to joining San Francisco State, Dr. Wong served as president of Northern Michigan University, an office he held since 2004. From 1999 to 2004, he served as vice president of academic affairs at Valley City State University in North Dakota where he was responsible for leading and sustaining technological initiatives within the curriculum, as well as fostering corporate, regional and international partnerships. He was also responsible for the leadership of six academic divisions, the information technology center, library registrar, mentoring academy and undergraduate research programs. He also held several leadership positions with the University of Southern Colorado in Pueblo (now Colorado State University at Pueblo) from 1996 to 1999, including serving concurrently as provost and academic vice president and interim president in 1997. He also served as academic dean and a member of the faculty at The Evergreen State College in Olympia, Washington. Early in his career, Wong was a psychology instructor at Pierce College in Tacoma, Washington. Dr. Wong serves on the Board of Directors of the Association of American Colleges and Universities, the San Francisco Chamber of Commerce, the Bay Area Council and the National Collegiate Athletics Association’s Board of Governors Committee to Promote Cultural Diversity and Equity. He served on the National Collegiate Athletics Association’s Division II President’s Council for three years. He was instrumental in securing passage of a new NCAA policy enabling universities from Mexico to apply for membership in Division II. Dr. Wong has received a number of national and community awards including the 2014 Asian Pacific Americans in Higher Education (APAHE) President's Award for Leadership and Contributions in Higher Education as well as the Region VI National Association of Student Personnel Association (NASPA) President’s award. He is also a member of the prestigious Committee of 100, a national and international organization with the dual mission of advancing constructive dialogue and relationships between the United States and Greater China, and advocating for Chinese American rights in the United States. First Lady Mrs. Phyllis Wong is a staunch supporter of San Francisco State and has been actively involved with a number of initiatives, including the annual student-led fashion show, campus garden tours and healthy, sustainable dining practices for students. 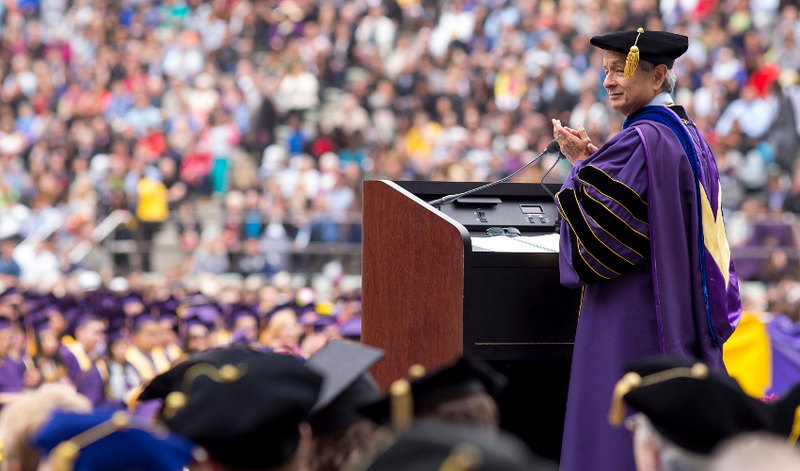 “Under President Wong’s leadership, San Francisco State has made remarkable progress in improving student success with graduation rates reaching all-time highs. The increase in graduation rates for students from traditionally underserved communities is particularly commendable. The campus’ tremendous success in fundraising will help maintain this upward trajectory for all students. New housing and academic facilities projects that are currently under way are just some examples of the groundwork that he’s put in place that will benefit future students as well as the entire San Francisco community,” said California State University Chancellor Timothy P. White. The CSU will soon launch a national search for Wong’s successor. Under university policy, the chairman of the CSU Trustees, Adam Day, and Chancellor Timothy White will select a committee made up of various campus stakeholders which will be publicly announced at a later date. Campus and community input will be sought in an open forum held on campus. Video: President Wong delivers a retirement message.